Contestants on some of our favorite game shows give us a peek behind the scenes. For decades game shows have appealed to all audiences. From our own living rooms we play along, competing against our fellow family members and cheering on complete strangers on screen. We feel the thrill of a Showcase Showdown win and the agony of an incorrect Final Jeopardy answer. (By the way, we totally knew the answer.) Every episode is another chance for an average Joe or Jane to stand under the bright lights and collect their prizes. But you may not have realized some of the contestants on TV hail from this area—and many of them walked away with major winnings. South Jersey Magazine spoke with some of them about their experiences, what really happens behind the scenes and just how much they won, if anything. But The Price is Right was Portella’s Holy Grail. “I used to fake being sick so I could stay home from school just to watch The Price is Right,” he says. In fifth grade he wrote a letter to the show asking why kids couldn’t be contestants. He received a letter back explaining federal law required contestants to be 18, but they also enclosed a card good for four tickets to a show. “It said, if you’re ever in L.A., come see us. I had them on my nightstand for 10 years,” he says. But Portella did win—big. In the first game he won a Chevy Cavalier playing Money Game with help from his friend in the audience. He made it to the Showcase Showdown where he ended up winning a living room set, home security system and another car—a Mercury Sable. His winnings totaled $46,955. Portella says he has nothing but nice memories of that experience. “It’s a rather beautiful thing to have a life dream come true at 22,” he says. Portella went on to work as a contestant coordinator for game shows for a little while and two years later, on the CBS lot, he saw Barker walking toward him. “I held up my hand and said, ‘I don’t know if you remember me…’ and he immediately replied, ‘You wrote the term paper on Janice.’ Of all the people he meets, he remembered me,” he says. Watching The Price is Right was a family affair for Linda Baquero of Marlton. “My mother and aunt watched every day. My aunt still does and she’s 101,” she says. But it was on a whim that Baquero decided to go to a taping of the show while in California for work. There was one problem: She didn’t have a ticket. She searched in vain and resigned herself to not going. After having dinner, she went back to her room and checked one more time. There was one priority ticket available for three days later on Nov. 28, 2016. She thinks the doughnuts were her ticket to her name being called. “When they said my name I didn’t even hear it. The studio is small and it’s so loud from the excitement. Then I saw my name on the board and just started shaking I was so nervous, plus I was by myself so I had no one to help. I didn’t even know what I was bidding on, so I asked the people behind me for help,” says Baquero. Once on stage with host Drew Carey, Baquero’s game was Spelling Bee where contestants need to spell the word “car” by selecting honeycomb-shaped cards. “This game wasn’t in any of the shows I studied,” she says. “It was pure luck that I got it. It was an out-of-body experience.” Her prize was a fully loaded Hyundai Sonata. Then it was time to spin the wheel, and here is where Baquero stunned herself and the audience. On her first spin she landed on $1, which guaranteed her place in the Showcase Showdown and $1,000, but also gave her an extra spin. “When I spun it, Drew said he knew this would be a good one. It landed on $1 again, which is $25,000. The producers on the show told me this was very rare,” she says. At the showdown, Baquero bid on the second showcase, which included a trip to the Grammy Awards with limousine and hotel, Coach handbags and a Kia Forte. She had the winning bid and totaled more than $78,000 in cash and prizes. It wasn’t until February 2017 when her episode aired, which meant several months of silence from Baquero. “You can’t tell anyone or else you can lose it all,” she says. On the day of her episode, she was traveling for work and the show was pre-empted by a news story, but her family back home was able to see it. Then came her trip to the Grammys, which she says was the experience of a lifetime. Qualifying for the show requires an online test and if you score high enough, there is an in-person audition which includes a personality interview, intelligence tests and simulated game play on camera. “After that point you can be put on a call list for 18 months and at any point be called up to come on the show. It was five months before I got a call and then there was an additional month before filming,” Udicious says. On the day of filming he had to be up early and hardly had time to let the nerves sink in. Contestants were allowed time to play around with the buzzer and work on their timing but then it was time to play for real. “They film all five episodes for the week in one day, and two names are drawn out of a hat to go up against the previous episode’s champion. My name was pulled in the first episode,” he says. Fortunately, Udicious won that first game. Before the second, he rushed backstage to change his outfit. “There was not a lot of time to focus and compose yourself for the next game. I am amazed at the contestants who win five or 10 in a row,” he says. DeSanto went through the process: Play simulation, spinning a fake wheel, calling out letters, solving puzzles, taking a written test—which he called “Hangman on speed”—where you had to solve as many puzzles as possible in five minutes. He made it to the next round and played against a faux contestant. And that was it. “They dismiss you and say they’ll send a letter if you’ve been chosen,” he says. Weeks passed and DeSanto thought for sure he was not going to hear back, but come Labor Day, he received a letter telling him to be ready on short notice for a taping date. That day came at the end of October. Wheel films six shows in one day, five of them being for that week’s theme. DeSanto’s theme was Southern Hospitality Week. Contestants were given the chance to practice on stage while producers determined who would play together and positioning on stage. “The lights were so hot, and the wheel is actually lighter than what I expected, and they give tips on how to spin so you don’t injure your hand,” he says. “It runs like a well-oiled machine. It’s a 22-minute show, and it was a 22-minute taping. They don’t play,” he says. 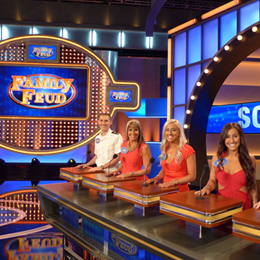 For those who watch Family Feud, part of the entertainment value isn’t just in the competition, but the personalities of the families as well. For the Scaffidi family of Glassboro, it was the perfect fit. When the show aired in November 2016, the local CW station attended the family’s watch party. “Everyone agreed our questions were hard,” she adds. Although the Scaffidis didn’t walk away with more than a $500 gift card, they didn’t get mad. “We were laughing and dancing the whole time. We wanted the other family to win, and it’s super fun to say we were on the show,” Scaffidi says.